Olivia Palermo at Kildare Village in Dublin,where she was today to shoot for Vanity Fair. I love how she looks perfectly polished and effortless chic. She looks stunning with minimal make up, loose hair in JBrand leather leggings, black top, oversized white blazer with L.A.M.B. python print heels.Her signature red nails and gold jewellery finished off her outfit. love it! simple but very chic and classy! She looks great! :) Thanks 4 the photos. S.
I found your blog some days ago and I want to thank you for your job! Olivia is so inspired me! Muito elegante. O preto e o branco são qualquer coisa como perfeito! Gosto! 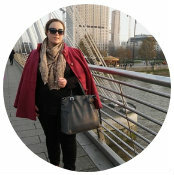 I like so much your blog Marta! I follow you since August 2011, and I'm so proud to have my blogspot to leave commentary! !